The tool guides you to the compatible sensors and part numbers for any vehicle, and indicates the correct torque values. Quickly program aftermarket sensors, one wheel at a time. 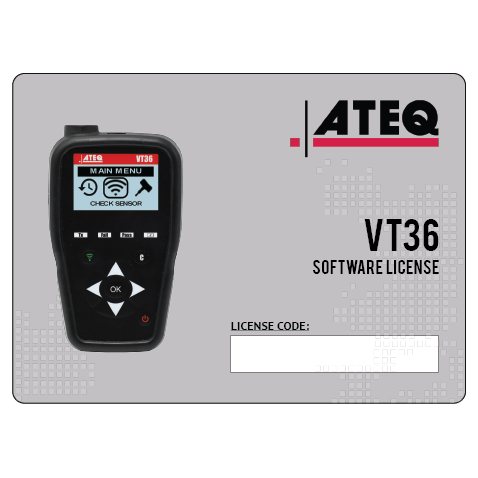 For relearn, use the VT36 with a diagnostic scan tool or follow the auto relearn or manual relearn instructions in the car user manual. Interface 23 languages: English, German, Italian, French, Spanish, Chinese, Croatian, Czech, Danish, Dutch, Finnish, Hebrew, Hungarian, Korean, Norwegian, Polish, Portuguese, Russian, Romanian, Slovak, Slovenian, Swedish, Turkish. Sensor coverage All OE sensors worldwide and most aftermarket sensors including Schrader EZ Sensor, Alcar by Schrader, Alligator Sens-it, Continental Redi Sensor, John Dow DVT, Hamaton U-Pro, T-Pro and EU-Pro, Huf IntelliSens, Italmatic Italsensor, Orange Universal and DirectFit, Qwik Sensor, Steelman. Detailed information about the VT36 including features, specifications and more.